Virginia creeper is definitely one of those plants that is a weed to some but a desirable addition to the landscape for others. 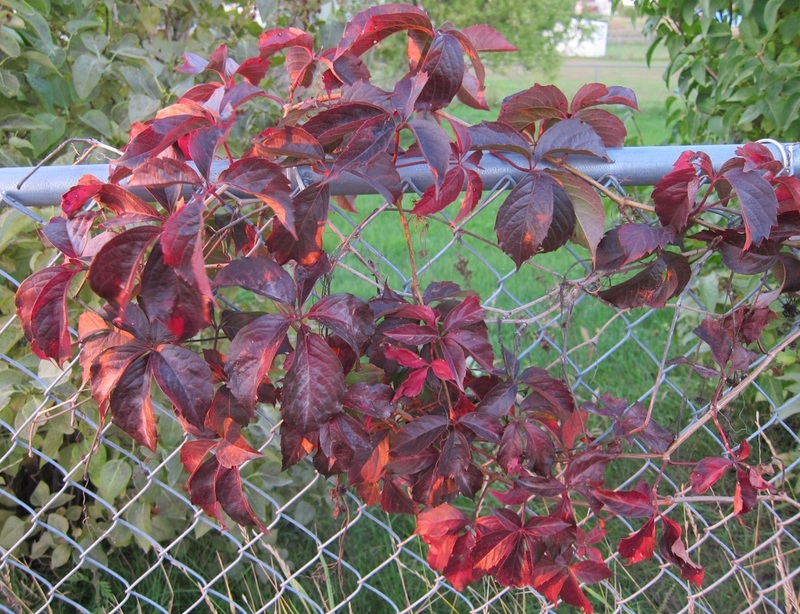 I have a vague memory of admiring a lush vine growing on a chain link fence around the school near our former home. Someone told me it was a Virginia creeper but I forgot about it until I was doing this entry. In the past 15 years the Virginia creeper has become more of a pest to me than beautiful landscaping. If it would just stay on a fence and off the ground, trees, electrical box, old stumps, rock piles, landscape blocks, hillsides and every other stationary object, I’d be fine with it. But it doesn’t. It does have a cool name that has been used in a lot of different ways. It’s hard to know where the name first originated but it could have started with a railway. A slow line that ran through the mountains of Southwestern Virginia was nicknamed The Virginia Creeper. That railway bed is now the Virginia Creeper Trail, a popular 17-mile trail for hiking, mountain biking and horseback riding that runs through a national forest and crosses the Appalachian Trail. It is considered to be one of the best biking trails in the nation. Virginia Creeper is also the name of a song by the Nashville string band, the Old Crow Medicine Show, an album by singer and songwriter, Grant-Lee Phillips, and even the name of a heavy metal Christian rock band. I think. I’m afraid I’ll sound old if I say I couldn’t understand any of their lyrics...but it’s the truth. Virginia Creepers is also the name of a team in the National Senior Basketball Competition, over 75 division. Last year singer Pat Boone played on the Virginia Creepers team. The name “Virginia Creeper” is just a cool name. However, the “creeper” part is actually a misnomer. It doesn’t really creep; it’s more of a climber if it has the choice. This woody, deciduous vine has sticky, disk-like appendages on its tendrils that it uses to grasp whatever is near. Perhaps a better description would be that it adheres to objects, rather like Super Glue – removing it from a wall can damage to the wall. If a person wanted the look of a hearty ivy on their house it would be prudent to put a trellis on the front of the house and let the Virginia creeper grow on that rather than damaging the house itself. Virginia creepers can be a huge. A single plant can climb as high as 60 feet and have a spread of up to 50 feet. The Latin name, Parthenocissus quinquefolia, is meant to be descriptive. Partheno means "virgin" (as in "Virginia") and cissus translates as "ivy." The plant is native to Virginia…as well as the entire eastern half of North America, but it’s not technically an ivy. The second part of the scientific name, quinquefolia, refers to the five leaflets that make up each leaf. 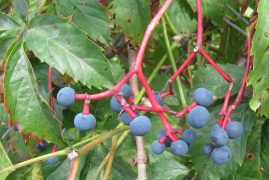 In the spring there are small, greenish inconspicuous flowers which form dark blue berries on striking red stems. The berries may look appealing and birds eat them but they are highly toxic for humans. 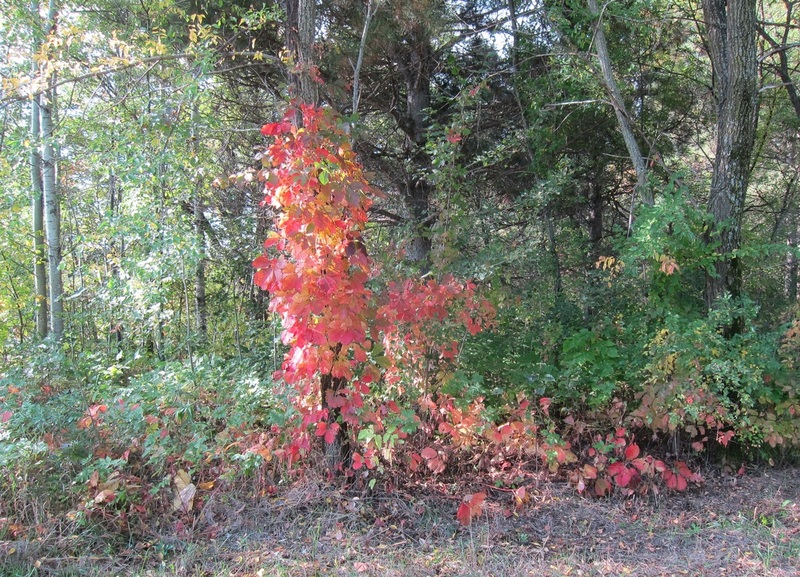 In the fall the Virginia creeper leaves turn deep red, almost burgundy or purple before dropping off for the winter. It is actually one of the more colorful fall species. 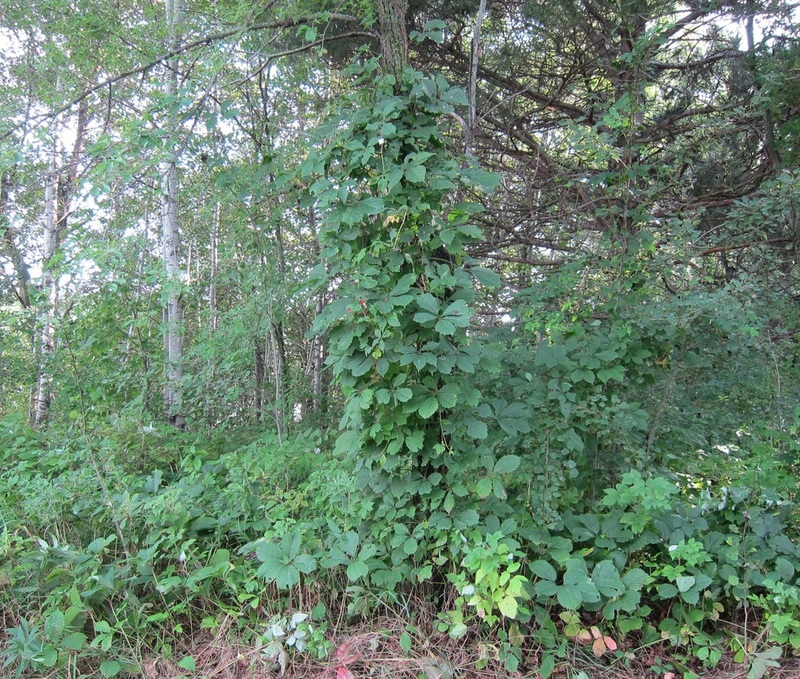 While it is frequently planted and cultivated as a covering for eyesores or for its beautiful fall foliage, it can easily take over an area and can kill trees and shrubs by blocking the sunlight they need to survive. Once it is established it is difficult to remove because it is a vigorous grower with foliage high in the trees out of reach. Furthermore, it also spreads underground by means of rhizomes. It’s a beautiful plant, but a word of caution – it can easily become overwhelming.